Using Perpetua E-commerce, you can easily set up online donations on your website. Enter the Default Amount. NOTE: This amount is a suggested donation amount. You can leave this box blank if you do not want to suggest an amount. Enter the Donation Categories. 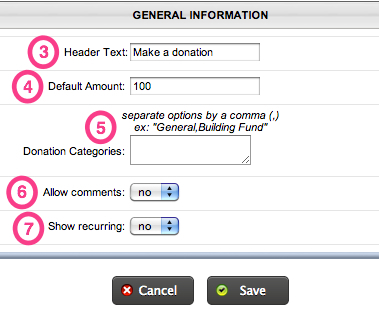 This will create a drop down list that your donators can choose which category to donate to. These categories should be separated by a comma with no spaces. Choose yes or no to Allow Comments. Choose yes or no to Show Recurring donations. NOTE: We would recommend that you leave this off and set up recurring donations separately. Recurring donations require the donator to create an account, so it is best if the donator create their account first and then set up their recurring donation after logging in. This will add the donation box to the page. Once someone submits a one-time donation, it takes them through the standard checkout process.